The sensitive connective tissue layer of the skin located below the epidermis, containing nerve endings, sweat and sebaceous glands, and blood and lymph vessels. Also called corium, cutis, derma1. the layer of the skin just below the epidermis, consisting of papillary and reticular layers and containing blood and lymphatic vessels, nerves and nerve endings, glands, and hair follicles. Formerly called corium. dermal, adj. The true skin (cutis vera) or corium. The dermis lies under the EPIDERMIS. the deeper portion of the SKIN of vertebrates that is derived embryologically from the MESODERM and lies beneath the EPIDERMIS which is of ectodermal origin. The dermis consists mainly of loose connective tissue, and contains nerves, blood vessels, muscles and sensory nerve endings, sweat glands and ducts, hair follicles and sebaceous glands. 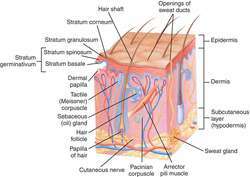 The basal layer of skin; it contains blood and lymphatic vessels, nerves, glands, and hair follicles. Two-zone skin layer: a superficial stratum that interdigitates with the epidermis, the stratum papillare, and the deeper and coarser stratum reticulare. n the layer of skin just below the epidermis consisting of vascular connective tissue. the corium; the principal layer of skin between the epidermis and the subcutaneous tissue; made up mostly of a network of collagen fibers but also containing nerves, blood vessels, cells and other fibers. It is divided into papillary and reticular parts, and when tanned forms leather. a greatly modified dermis, continuous at the coronet with the common dermis of the skin; the modified dermis supports the horn of the hoof. NLCS is a rare benign hamartomatous skin condition characterised by the presence of mature ectopic adipocytes in the dermis. Microfotografias de piel de individuos sin y con dactilograma evidenciando diferencias en las fibras elasticas: a) En piel de digito pulgar de individuo femenino de 85 anos sin dactilograma, se observan fibras elasticas apenas perceptibles en la dermis papilar (flechas). Moisturisers or emollients work in 2 different ways, by either blocking the escape of water from the skin (occlusion) or by drawing water to the epidermis from the dermis (humectants). The epidermis was peeled off from the dermis after overnight incubation in 10X phosphate buffer saline with antibiotic cocktail and EDTA. 6 times larger than that of the stiffened dermis on average. The thickness of the skin and its component layers (epithelial layer, stratum corneum, dermis and hypodermis) was measured using a computerized light microscope (Nikon, AXIO-OEVT-35M, German) and spot basic software (USA). A skin tear is a traumatic wound that results from the separation of the epidermis from the dermis, or the epidermis and dermis from the subcutaneous tissue and is usually related to friction and/or shear combined with blunt force. Dermis ve epidermis kalinlik olcumunden elde edilen veriler normal dagilim gosterdigi icin t-testi ile analiz edildi. Se establecieron algunos parametros para la medicion del grosor de capas: por cada corte evaluado se midieron en promedio tres puntos de la epidermis y tres de la dermis, que fueron promediados para obtener un dato unico por zona de cada ejemplar; se midio la epidermis desde la parte superficial hasta el punto comprendido antes de la capa de melanoforos; y se realizaron mediciones de la dermis que incluyeron las dos capas de melanoforos que la flanquean. One of the three major building blocks of your dermis (your deeper layer of skin), gives skin strength and durability. vital: Your A-Z guide to healthy skin; EVERYTHING YOU NEED TO KNOW ABOUT BEAUTY.. It is characterized by necrobiotic changes in the dermis that extend down to the perichondrium; associated alterations are seen in the cartilaginous plate. It gently scrapes and remove damaged tissue while minimizing damage to healthy dermis.